There’s really no need for a recipe for this one! I just threw a whole bunch of grapes into my blender along with some milk, yogurt, a tiny bit of honey and some vanilla essence. Blend everything together until smooth and frothy. Pour into your favorite glass and drink! While the smoothie may not be much to look at, it certainly is simple, filling and tasty. I saw this on one of my favorite blogs- Vaishali’s Happy Burp. Sadly, her blog has not been showing any signs of life for almost a year now. Off this goes to Sig who is hosting the March edition of Monthly Blog Patrol. Healthy enough to take as bf!! 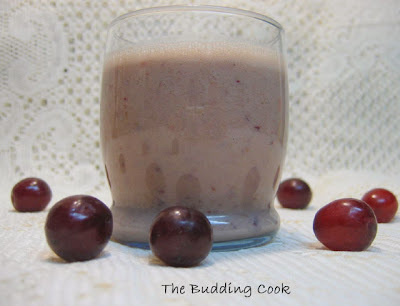 yum... love the idea of grapes and honey and yogurt together... Thanks for the entry TBC! There used to be a place back home which used to serve grape juice with skinned grapes at the bottom - your picture somehow reminded me of that! That so cool TBC! Nice idea of adding vanila essence! Usually I add rose essence!Should try this next time! Great fruity cocktail tbc. Take care girl! I keep making all kinds of smoothies. Love this. milk,yogurt..i wonder how it would have tasted. Looks Delish. Wow , that has got such nice color TBC. That's a refreshing drink. I am not blog hopping these days that much and didn't even know that others are hosting MBP. Smoothie has made me thirst for it! Lovely color, great pic! Should try them so east to do but never thought about doing them. This is a great idea for a smoothie! Thank you for sharing. Oh yes, this is as refreshing as they come! Nags- I like what u did too. Sra- hmmm, so my pic took u down memory lane, huh? Suma- oh, don't feel bad about that. There are no rules about this kind of thing. I don't participate in most of the events either. Thanks for tagging me. I have not yet done a single meme though I 've been tagged several times before. It would mean having to spend way too much time on the computer, and I do enough of that already! I am also not comfortable talking about myself. love the recipe!!! looks so temptin g and easy to make! !